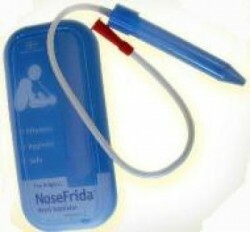 I was recently reminded about this great European snotsucker, the nosefrida, when my daughter caught my cold and became congested. A client recently turned me on to this great device, which is much slicker and safer to use on our littlest ones’ noses. Consider this improved alternative to the blue bulb nasal aspirators.